What Is A I-765 Form? Thousands of foreign workers come to the United States looking for better job opportunities. But before they actually get employed they must go through a tedious procedure to confirm their status. According to the U.S. laws an employer isn’t allowed to hire people without work permit referred to as Employment Authorization Document. With this document an individual can prove that they are allowed to be hired in US and work there for some period. 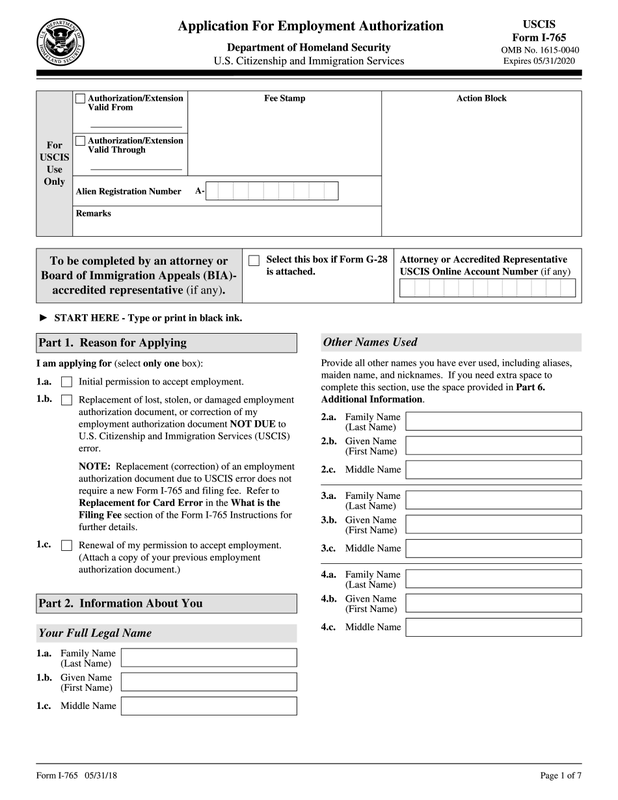 The right way to get this permission is to complete Application for Employment Authorization. However, not every person who comes to US is eligible to get EAD card. Who may file the application? Immigration status. All refugees, asylees, students from abroad and U nonimmigrants must get legal confirmation for their employment. EAD renewal. A person is allowed to get a new card if the previous one is about to expire or has already expired. Replacement process. If the card was stolen, lost or contains inconsistent information its owner can get the new one. There is no need to file Form I-765 if an individual is a green card holder or has been invited to the US to work for a specific company. How to fill out the application? First, get the sample in PDF format. You can download it from the USCIS website or complete it online straight from our resource. The copy is printable so you can have a paper version, if you’d like. There are only two pages with 19 questions. Answer the questions entering accurate data into fillable fields. The minimum data that must be provided is filer’s name, SSN, place of birth, country of citizenship, the date of the last entry to US territory, etc. Additionally you may be asked to complete the Worksheet. It aims to define whether a person has an economic background to work in US. It’s only one page long and is divided into three parts. The first part is for personal data, the second one requires financial info, the third part is designed for explanations. You must also attach nonimmigrant record if any and two identical photos. Follow the detailed instructions to properly complete all fields. Where to file the document? Make sure that you’ve correctly completed all sections. Then send the final version to the USCIS. The processing time depends on what category the filer’s case belongs to. For the cases other than asylees the procedure will take 30 days while the asylees will have to wait 90 days before USCIS announces its decision. There is also filing fee that you will have to send with your template and biometric payment withdrawn from all individuals between ages 14 and 79. If done everything right, you will soon be able to find a good job in U.S.
Save time filling out the forms you need straight from our platform. You can also collaborate on any document, get it signed or filled by others in a few clicks.